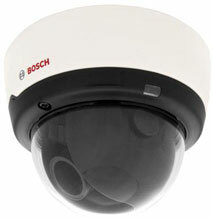 The Bosch NDC-255-P IP Dome are ready-to-use, complete network video surveillance systems inside a compact dome. These cameras brings Bosch"s high-performance technology into the realm of small office and retail businesses by offering a cost-effective solution for a broad range of applications. The cameras use H.264 compression technology to give clear images while reducing bandwidth and storage by up to 30%.